At a time when bike interest is at its highest for many years, so unfortunately is bike theft with over 500,000 cycles reported stolen each year. A figure which hides the true picture as over half of all cycles stolen are from homes, a crime listed as a burglary, and many more go unreported. The increasing trend of breaking down modern high end bikes to sell on the components means protecting an entire bike, and not simply the frame, is vital in the fight against crime. This is where DATATAG, security experts already trusted to provide the technology behind many official industry schemes come in. The UV "Stealth" PRO system offers a multi-layered approach and allows owners to mark not just frames but also valuable components like forks, wheels, brake levers, derailleurs and bars providing complete protection - something unique to the market. Recent theft figures for all cycles marked with the new Datatag Stealth systems indicate a theft rate of just 0.5%. This is an incredible result as according to the police the historic average is 10%, with road.cc suggesting it's actually as high as 20%. The Police recover thousands of cycles each year but due to a lack of crime reporting and a lack of owner registration many are simply sold at auction and never returned to their rightful owners. A Datatag system will not only help deter theft but will also help in reuniting you should your bike be stolen and recovered as it provides undeniable proof of ownership. The Datatag systems offers premier identifiers combined with probably the most comprehensive database of its kind in the market today. Equally importantly, Datatag works with the Police to back up the product and provides free database access on a 24/7 basis as well as technical training. Owners of Datatagged cycles can also benefit from reduced premiums from some of the major insurers. Recent statistics show a Datatag protected cycle is 40 times less likely to be stolen! Protect your bike not just your frame. For cycle security there is only one choice. * Terms & conditions apply. Offer ends 31/12/2019 and is not available in conjunction with any other offer. This offer is only redeemable on lunar and calendar monthly policies and not where premiums are paid annually. Once you have registered your [product] with Datatag, you will be sent an email confirmation with an attachment containing your unique promo code. 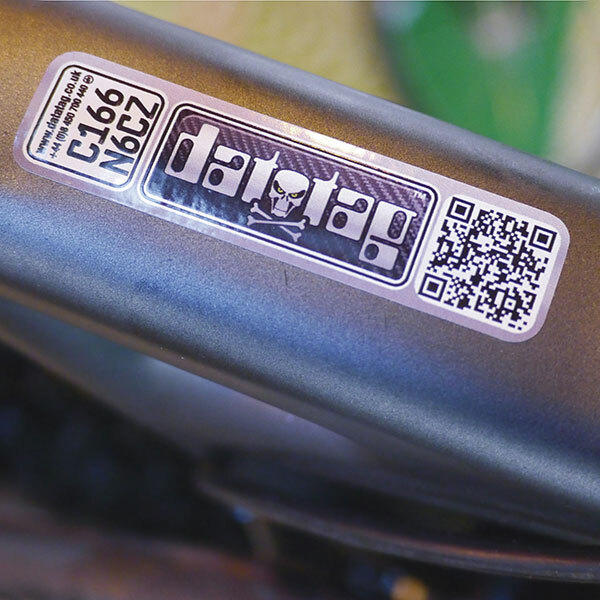 The Datatag System contains 4 UV "stealth" etches to permanently mark your frame and forks. 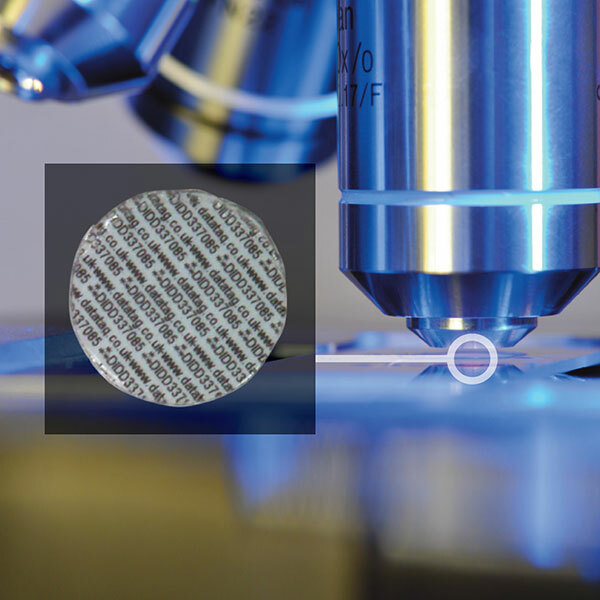 The unique, almost invisible UV etching system forms a major part of the theft deterrent and subsequent identification. Marking your cycle permanently these "stealth" UV etches won't visibly mark your cycle paintwork. Developed for ease of application these microscopic Datadots® can be applied to any surface, thus making it virtually impossible for the criminals to locate and remove them all. 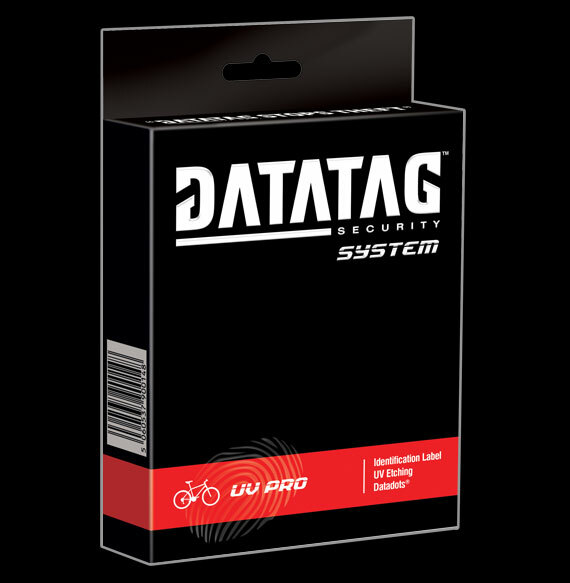 The Datadots®, held in a UV trace silicon glue, can be used to mark all your cycle components and accessories. These specially designed Datatag tamper evident labels contain a unique cycle identification number and QR code. They warn off any potential thieves and are both attractive and impossible to remove without damage. 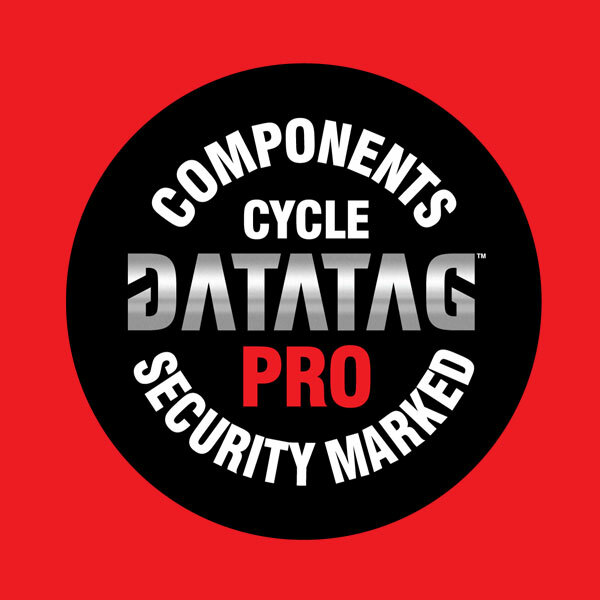 These specially designed labels warn potential thieves that your cycle and components are protected by Datatag. FACT: The Police recover many thousands of stolen bikes every year. But with no link to owners many are sold at auction and not returned. FACT: Expensive bikes become parts within hours of being stolen and frames are junked. Components, often more valuable than frames, are sold with zero risk to thieves as they have no identifying marks or numbers. Recovery rates as low as 5% supports this evidence. FACT: Even if you do find your stolen bike on line, proving that it is actually your bike is very difficult - often impossible - so trying to get police to take action is very hard. How is Datatag a theft deterrent? Most cycles are stolen by professional criminals. Even the latest chains and locks do not always deter criminals although the more measures you take - the better. It's therefore essential that all cycles are protected and registered with a Datatag security system. This is because the majority of cycles stolen are stripped down for their parts and sold off separately. Criminals know it's virtually impossible to defeat the multi-layered Datatag system and as such Datatagged assets become too risky. How does the UV "Stealth" etching work? The UV "stealth" etchings protect and deter theft of valuable frames and forks. 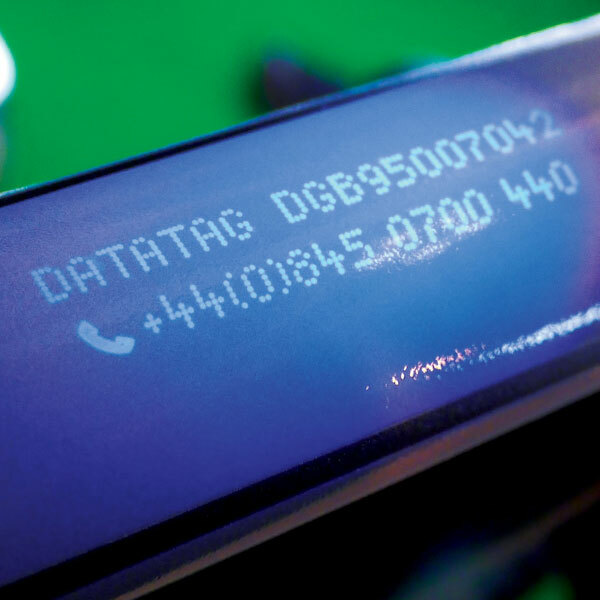 The benefits of using UV etching is that the unique code and Datatag's 24/7 contact details are still permanently etched into the frame but now, because they are only visible under ultra violet light, don't deface the appearance of the cycle - a perfect combination. Datadots are transparent microscopic plastic discs (less than 1mm in diameter) printed with a unique alpha numeric code and listing Datatag's telephone number. There are hundreds within the system and they are applied in hidden places on your property. Only one is required to prove ownership therefore a thief would have to be 100% confident that they had found and removed every single one to avoid detection and prosecution. Is my personal and property information safe? Yes, Datatag are accredited to the strictest database standards including ISO:9001 and LPS 1224 (The recognised standard for database security) and are a "Police Preferred Specification - Secured by Design" company accredited and supported by NPCC (National Police Chiefs Council) and the Home Office. Datatag do not share confidential data with anyone unless for security reasons - we may occasionally communicate with customers to keep information up to date, something which is critical in the fight against crime. What happens if I sell my property? The Datatag membership is transferable, and for a small re-registration fee, the new keeper can have their name and address added to the secure Datatag database ensuring continuity of protection for the new owner. What happens if my property is stolen? Please advise the Police immediately, then contact Datatag on 03450 700 440 quoting your membership number and the crime report number the Police have given you, and we will flag a warning against your vehicle on our database.